The story behind Amazing Grace is almost as remarkable as what's on the screen. In 1972, Warner Bros. Pictures hired director Sydney Pollack to document the recording of a gospel album by Aretha Franklin. This was not just any album. The legendary singer planned to record it live at the New Temple Missionary Baptist Church in Los Angeles, backed by its choir. Technical problems syncing the sound with the images rendered the film unable to be completed, and it sat in the studio's vault for decades. Producer Alan Elliott eventually obtained the rights to the footage and used modern technology to solve the problem. But then, for whatever reasons, Franklin repeatedly took legal action to prevent him from releasing it. A scheduled premiere at the 2015 Telluride Film Festival was cancelled at the 11th hour because of an injunction. After Franklin's passing, Elliott was able to get her estate's permission to release the film, which is an extraordinary gift to her fans. Amazing Grace is exactly what it sounds like. Franklin arrives at the church and passionately sings a bunch of gospel songs. The next night, she shows up again to sing more. In addition to the choir and production crew, there's an audience of spectators in front of her. Most are members of the congregation. Mick Jagger can be spotted in the background. Everyone is instructed to sing, clap, cheer, and generally react to Franklin's music. While that sounds basic – and, truth be told, is basic – the cumulative effect is anything but. Something happens in this church over the course of two evenings. It's unseen, yet undeniably felt. Franklin, intensely focused throughout, goes to another place when she's singing. Her flawless vocals are astonishing, even for her. The meaning embedded in the songs visibly fills her spirit. She isn't just singing, she's channeling. It's a once-in-a-lifetime performance. Watching the reaction of those in the room will blow your mind. People are moved. An energy that isn't initially there is created and grown. Night two is especially enthusiastic, with audience members getting up out of their seats, dancing in the aisles, and demonstrating a complete inability to contain the joy that Franklin is delivering by singing praise to the Lord. If you don't believe in God, you just might after this. The downside, to the extent that there even is one, is that there's a certain visual monotony to the film. It's just straight performance footage, with no backstage scenes or interviews to break things up. And because Pollack had no way of knowing what was going to happen, you don't get the kind of carefully-composed shots that you'd find in a normal concert documentary. Of course, that's barely a criticism because the fly-on-the-wall quality is precisely what makes Amazing Grace distinct. The film gives you the sensation that you're right there, witnessing perhaps the greatest singer who ever lived recording a landmark work. This is a joyous celebration of Aretha Franklin, great music, and Jesus. You walk away feeling completely uplifted. 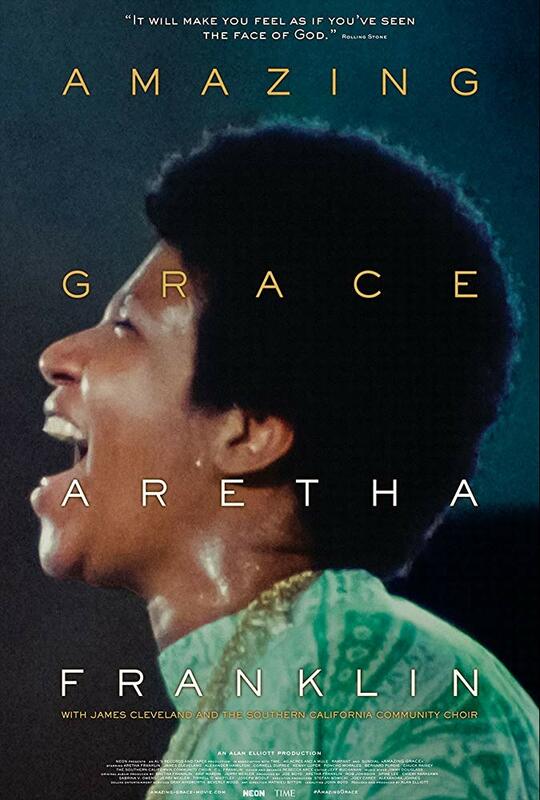 Amazing Grace is rated G. The running time is 1 hour and 29 minutes.